This research paper explores the impact of the local socio-cultural milieu on the social upgrading of the glassware cluster Firozabad. The Firozabad Glass-ware Cluster known as the ‘Glass City of India’ has been manufacturing glass bangles for centuries, but around 3 to 4 decades ago it started diversifying by producing glass products for the international market. The inclusion of the Firozabad glassware cluster in the global value chain was encouraged by the United Nations Industrial Development Organization with support from the national and regional governments of India between July 1992 and 2000 through economic upgrading processes to boost the competitiveness of glass-ware in the global market. Despite the effort of the economic upgrade, this did not significantly result in an improved competitive position of the glass cluster in global market. The evaluation carried out by UNIDO in 2000 revealed the immediate need of social upgrading but casted doubt on the socio-cultural challenges in achieving social upgrading. Yet, despite this, not much has been done to attempt to assess the impact of the local socio-cultural milieu on social upgrading. 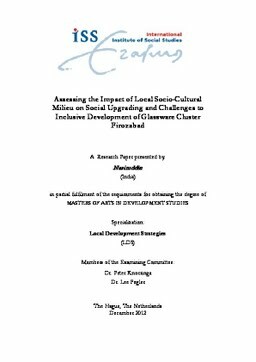 This study thus traces the impact of the local socio-cultural milieu and how it hinders social upgrading. The conclusion is reached that the glassware cluster has been facing serious socio-cultural challenges because the owners of factories are divided into groups based on religion, caste and community and other socio-cultural factors. The cooperation and sharing of knowledge, resources, technology, employment and developing partnerships with businesses are based on socio-cultural factors which results in loss of opportunities and the socio-economic exclusion of certain communities. Moreover, the unfair practices at workplace are making the labour condition worse, insecure and highly unstable. In turn, such practices cause the labour force to have little faith in the factory owners investing in social upgrading which create unhealthy inter-firm relationships and affect the need for social upgrading and therefore the competitive position of glassware in the global market.